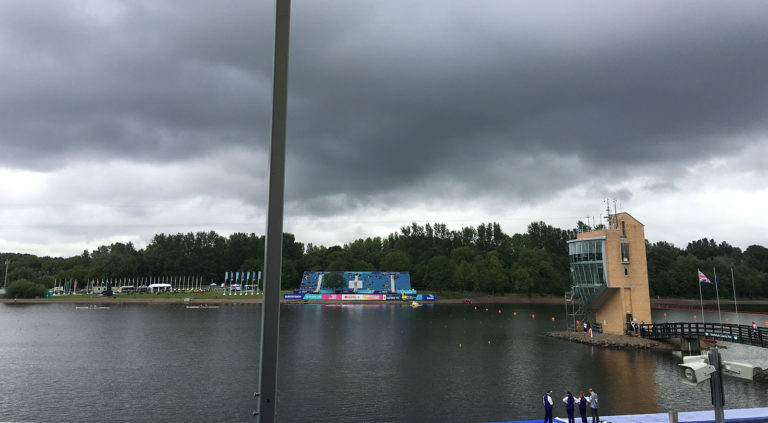 Welcome to Strathclyde Park, where what feels like a mini-Olympics is being staged as the European rowing championships of 2018, within a wider multi-sport event. After a couple of preparation days during which the bumpy open water of the the loch raised a few memories of challenging Rio winds, the weather calmed down enough for a flat-water opening session where the biggest risk was the weird circulation system which includes crossing the racing lanes and navigating a tight warm-up area beside the ‘no go’ shallow silted up area on the far side of the lake. It’s like dropping straight from the world cups into the junior championships, coming to the Europeans this late in the summer. Suddely the biggest entry is the 17-crew LM2x, nobody has quarter-finals, and nine of the (only) 18 events saw the heat winners qualifying directly to finals. Everyone’s finished racing by 2pm and there’s a curious gap in the psyche, a NZL/AUS/CAN/USA-shaped hole where our biggest overseas rivals were a couple of weeks ago. It’s strangely unsettling, the relief being that good solid rowing races still carry on as usual. The most successful country on Thursday was the Netherlands, who got five of their 14 crews through to finals at the first time of asking in a Belgrade-like flush of success. One of their triumphs, a win for the men’s eight, put the British M8+’s nose severely out of joint. The Brits had swapped stroke Will Satch and 3-man Ollie Wynne-Griffith a week ago, to try something new and give Satch a bit of a rest, and had been hoping to wipe the floor with the Dutch after good results in training. Instead it was the Dutch doing the wiping, bombing out to clear water than strolling home watching the Brits struggle behind to second and another repechage place. In the other heat the Germans managed to avoid two swans and make half a second look like a majestic win after burning off Romania and ignoring a shockingly off-the-boil Italy. The Dutch also won heats in the men’s quads (also ahead of the frustrated British, though this time both went through to finals), the women’s doubles and the women’s lightweight doubles. 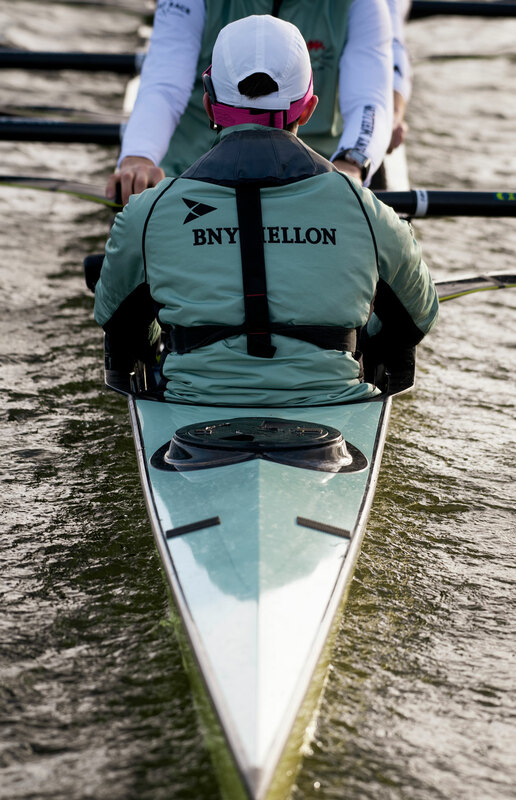 The women’s eights is a straight final – Netherlands, Romania and Britain – because most of the European teams don’t have enough female athletes to muster both an eight and a coxless four. Conversely the fours event is highly competitive, and heat winners Russia and Romania were pressed hard to the line by Poland and Germany respectively. Britain had thought they would take the second spot behind Russia but lost out by 0.01sec in the only photofinish of the day, to Poland. 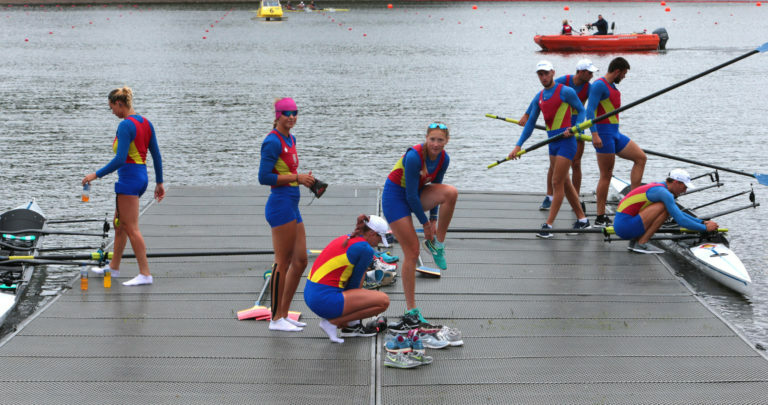 The women’s fours could turn out to be a better event here than the men, where the absence of non-EU countries and the fatigue of Romania’s impressive young four, who won gold at the under-23s only two days before travelling to Scotland, took some of the bite out of the heats. Some superstars had easy rides through the first day. The Sinkovics strolled to victory in the men’s pairs, as did W1x champion Jeannine Gmelin, but the O’Donovan brothers had a good old scrap with the new pairing of Pierre Houin and Thomas Baroukh, which augurs well for this event and a feisty final on Sunday. And in fact there may be surprises lurking in the wings: in a different M2- heat the Onfroy brothers from France looked surprisingly relaxed losing to Romania, suggesting they may be keeping their powder dry to explode against the Croatians later on. And Austria’s Magdalena Lobnig was in excellent form winning the second W1x heat: never a sculler to be written off. The most interestingly open event is the men’s singles, where both Ondrej Synek and (we presume) Oliver Zeidler are absent leaving the door wide open to all sorts of pretenders. Best of the heap today were Kjetil Borch (NOR), Roman Roeoesli (SUI) and the evergreen Griskonis Mindaugas, a man born to take opportunities when they present themselves. The over-confident swans continue to be pests, but unfortunately hitting them isn’t an option. It’s probably a capital crime in the UK because they’re royal birds — protected by the Queen — and roast swan is only on the menu if you have crowns in your direct ancestral line. The rain held off until the end of racing at least, despite the threatening clouds. Oh, and for those scratching their heads, ‘European’ in this context is the FISA definition, ie those countries in the rowing European geographic area, and includes Israel and Azerbaijan. How very Eurovision….